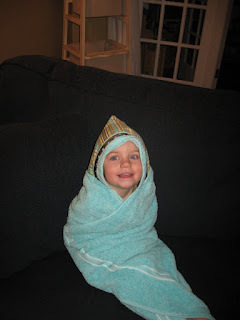 Have you ever thought that maybe your kids could use a bath towel that was just a little bit cuter? Well a long winter meant I was bored and decided to be a little crafty. 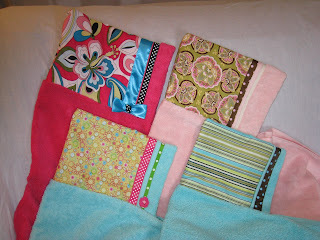 I started making some hooded bath towels and of course had to add a few extras. I still have some left and would also be willing to make one if you have a specific color in mind. I know all the towels shown are a little girly but that's only because everyone I know has been having boys so the "boy" colors were sold or given away as baby gifts. I've been selling them for $20, if you're interested or know someone who might be please let me know. As you can tell, Jenna loves her hoody! I love the one you made for Evan for my baby shower! It's so cute and he loves it too.